Chiltern Railways is a British train operating company owned by Arriva UK Trains that has operated the Chiltern Railways franchise since July 1996. It operates commuter/regional rail passenger services from its Central London terminus at London Marylebone along the M40 corridor to destinations in Buckinghamshire, Oxfordshire and Warwickshire, as well as long-distance services to the West Midlands along two routes. Services on the Chiltern Main Line run from London Marylebone to Birmingham Snow Hill, Stratford-upon-Avon and Oxford Parkway, with some peak-hour services to Kidderminster. In June 1996 M40 Trains was awarded the Chiltern Railways franchise by the Director of Passenger Rail Franchising for a period of seven years with operations commencing on 21 July 1996. M40 Trains was a management buyout led by some former British Rail managers who held a combined 51% shareholding backed by John Laing plc (26%) and 3i (23%). A restructure in March 1999 saw John Laing taking an 84% shareholding with the remaining 16% owned by the former British Rail managers. In March 2000 the Shadow Strategic Rail Authority announced M40 Trains and Go-Ahead had been shortlisted to bid for the next Chiltern franchise. In August 2000 M40 Trains was awarded a new franchise, to run for 20 years conditional on various investments being made. The new franchise started on 3 March 2002. In August 2002 John Laing acquired the remaining 16% of shares in M40 Trains it did not already own. In September 2006 John Laing was purchased by Henderson Equity Partners. 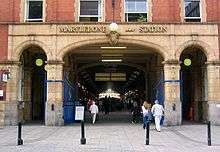 In December 2004 Chiltern Railways took over operation of passenger services on the Leamington Spa to Stratford-upon-Avon branch line from First Great Western Link. In June 2006 M40 Trains was invited by the Department for Transport to lodge a bid to operate the Snow Hill Lines lines then operated by Central Trains, as part of the letting of the West Midlands franchise. The bid was not successful. In July 2007 Henderson Equity Partners put Laing Rail up for sale. Arriva and Go-Ahead both expressed an interest in acquiring Laing Rail, but by December 2007 only Deutsche Bahn of Germany and NedRail of the Netherlands remained in the bidding contest. In January 2008 Laing Rail was purchased by Deutsche Bahn and Chiltern became part of the DB Regio group. A restructure in early 2011 saw DB Regio become a subsidiary of Arriva UK Trains. In May 2011 Chiltern took over operating services on the Oxford to Bicester Line from First Great Western. Chiltern Railways operates regular services on five routes. The Chiltern Main Line is the core route for the majority of Chiltern Railways services and is one of two "mainline routes" operated by the company. The route runs between the UK's major cities of London and Birmingham (Marylebone and Snow Hill stations respectively) and also passes through the large towns of High Wycombe, Banbury, Royal Leamington Spa, Warwick and Solihull. Chiltern Railways operates trains along the entire line, with services ranging from stopping suburban trains (e.g. London Marylebone - Gerrards Cross) to high-speed, express trains running the full length of the line between London Marylebone and Birmingham Moor Street. The fastest timetabled journey from Birmingham to London via this route is 103 minutes (compared with 82 minutes using Virgin Trains services between Birmingham New Street and London Euston via the West Coast Main Line). In addition to the Chiltern Railways services, CrossCountry also operates regular services on the line north of Banbury, and London Midland operates regular services north of Dorridge. The London to Aylesbury Line is the second "mainline route" operated by the company. The route links London (Marylebone) with the town of Aylesbury via Amersham. All Chiltern Railways on this route run the full length of the line between Marylebone and Aylesbury stations and call at all stations north of Amersham; most trains are extended one station further to Aylesbury Vale Parkway. 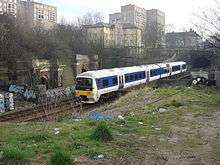 The line runs alongside London Underground's Metropolitan line between Finchley Road (just north of Marylebone station) and Harrow-on-the-Hill, with each operator running on separate tracks. Beyond Harrow-on-the-Hill, the tracks are shared between Chiltern Railways and Metropolitan line services. This is the only situation where National Rail services use non-Network Rail tracks and it uses a unique unregulated track-access agreement with London Underground. Beyond Amersham (where the Metropolitan line terminates), all services are operated by Chiltern Railways only. The other three routes regularly served by the company are all branch lines. The Princes Risborough to Aylesbury Line links Princes Risborough, on the Chiltern Main Line, with Aylesbury, on the London to Aylesbury Line. Most trains on the line continue beyond Princes Risborough to London Marylebone, which gives Aylesbury an alternative route to reach central London; however, a few services terminate at Princes Risborough. 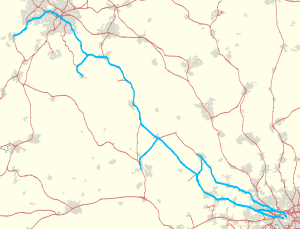 The Oxford to Bicester Line branches off the Chiltern Main Line just south of Bicester and links the town with Oxford. The line is mostly served by express services to and from Marylebone. Currently (July 2016), the line terminates a few miles northeast of Oxford, at the nearby Oxford Parkway station; however, the line is expected to be extended to the main Oxford station by the end of the year. The Leamington to Stratford Line branches off the Chiltern Main Line at Hatton (a few miles west of Leamington Spa) and runs to Stratford-upon-Avon. The branch line is also operated by regular London Midland services. Little Kimble is mostly served hourly, but there are two-hour gaps between some services. At peak times on weekdays, some services between London Marylebone and Birmingham are extended beyond the latter, to and from Kidderminster (via Stourbridge Junction). These trains run to Marylebone in the morning peak, and return towards Kidderminster in the evening peak. The trains also call at some stations between Birmingham Moor Street and Kidderminster, although not all services have the same calling pattern. As of July 2016, there are four trains in each direction between Marylebone and Kidderminster, plus another one which is extended only as far as Stourbridge Junction. On Saturdays, there are also four morning trains from Kidderminster to Marylebone but there is no return service in the evening. There is no Chiltern Railways service to Kidderminster on Sundays. Regular trains between Birmingham Moor Street, Stourbridge Junction and Kidderminster are operated by London Midland as part of its Snow Hill route service. Cherwell Valley Line: On weekdays, in the very late evening, there is a single daily service running on the Cherwell Valley Line between Banbury and Oxford, operated by Chiltern Railways. This service starts from Stratford-upon-Avon, runs southbound to Oxford before terminating and returning north as far as Banbury. The northbound service also calls at Tackley and Heyford, the two intermediate stations on this section of the line. New North Main Line: the company also operates a weekday parliamentary service on the New North Main Line to and from London Paddington, in the late morning. Currently, there is one train per day running from South Ruislip, via the single-track line parallel to the Central line to London Paddington, and a return service to West Ruislip (via South Ruislip) back the same way. The New North Main Line offers an alternative route to central London for the Chiltern Main Line and can be used to divert trains away from Marylebone when the station is closed for engineering works. On certain Bank Holiday Mondays, services are extended from Aylesbury to the Buckinghamshire Railway Heritage Centre facilities at Quainton Road, a short way south of Verney Junction. These services are often run by one of Chiltern's two Class 121s. Since winning the franchise, Chiltern has introduced "Route: High Wycombe" tickets for the Chiltern route between Birmingham and London that are considerably cheaper than "Route: Any Permitted" tickets, valid on the faster Virgin service to London Euston as well a number of other operators and routes. Chiltern offers only Standard Class, not Standard and First Class as on Virgin services. However, Chiltern does offer a premium economy "Business Zone" cabin on a small number of Birmingham to London peak-time trains. Passengers pay an upgrade of £15 (off-peak) or £25 (peak time) to sit in a larger first-class-style seat with refreshments included. Chiltern was considered one of the best operators in Britain, with Public Performance Measure (PPM) regularly over 90%, until the introduction of changes in November 2015 and infrastructure issues saw punctuality fall to 86% in December 2015. Chiltern's PPM is measured on stricter conditions than its long-distance rivals, such as Virgin Trains, as Chiltern has a 5-minute window for performance while others have a 10-minute window. Performance figures published by Network Rail rate Chiltern Railways sixth in train operating companies in the UK at 89.4% (PPM – period 9) and 94.3% (MAA) for the year to 12 December 2015. A new timetable introduced on 4 September 2011, combined with significant disruption caused by engineering work, caused a negative reaction from customers. A petition to have the service reviewed was started, and articles highlighting the plight of commuters appeared in the local press. A new timetable introduced on 10 December 2012 also met with frustration and opposition from some customers, particularly those using Saunderton and Princes Risborough stations. Chiltern passenger numbers in millions (annual rolling average) 2010/11-2016/17 Q1. Evergreen is the name given by Chiltern to the major infrastructure works that the company has committed to over the 20-year duration of its franchise to improve routes and services. This has been divided into three distinct phases. The main focus of phase 1 was the redoubling of the Chiltern Main Line between Princes Risborough and Bicester North in 1998 and Bicester North and Aynho Junction in 2001, together with the reconstruction of Haddenham and Thame Parkway from a single platform to two platforms, the installation of a new platform at Princes Risborough, and the raising of the line speed limit. Phase 2 began after the award of Chiltern's new 20-year franchise. This entailed a realignment of the route through Beaconsfield to allow speeds to be increased to 75 mph, improved signalling between High Wycombe and Bicester and between Princes Risborough and Aylesbury, the construction of two new platforms at London Marylebone on the old carriage sidings, and the construction of a new depot at Wembley. The Department for Transport, Chiltern Railways and Network Rail agreed in January 2010 to a £250m upgrade of the Chiltern Main Line. Phase 1 of the project, now complete, involved upgrading the Marylebone – Birmingham Chiltern Main Line to permit 100 mph running on 50 more miles of route. Junctions at Neasden, Northolt and Aynho were remodelled to permit higher speeds. The 'up' through track has been restored at Princes Risborough, the existing 'up' line becoming a platform loop, a new turnback siding has been provided at Gerrards Cross, and a new, straighter 'down' through track built from Northolt Junction (where the original layout favoured the now little-used Paddington route) to Ruislip Gardens. The existing 'down' track continues to serve South Ruislip station. The former speed restrictions through Bicester North have been removed to permit 100 mph running. Two additional terminating platforms at Birmingham Moor Street were reopened in December 2010. Accelerated services were initially planned to start in May 2011, but there were delays and it was not until 5 September 2011 that Chiltern was able to introduce a new timetable to take advantage of the improvements. As a result of the speed increases, journey times have been reduced significantly. From Marylebone, the fastest peak-hour journey time to Birmingham Moor Street is now 90 minutes, instead of 117 minutes previously. The table below outlines the peak timetable improvements. Chiltern Railways former chairman Adrian Shooter said, "This is the biggest passenger rail project for several generations not to call on the taxpayer for support. Working closely with Network Rail, we are going to create a new main-line railway for the people of Oxfordshire and the Midlands. This deal demonstrates that real improvements to rail services can be paid for without public subsidy by attracting people out of their cars and on to trains." In October 2012 the Secretary of State for Transport granted permission for work to begin on Phase 2 of the Evergreen 3 project, with services between London Marylebone and Oxford. Under Phase 2, a quarter-of-a-mile double track has been constructed joining the Oxford to Bicester Line at Bicester Town to the Chiltern Main Line, allowing a new Oxford to London Marylebone service to operate. A new station, Oxford Parkway, has been constructed at Water Eaton; the service between Oxford Parkway and London started on 26 October 2015, with the link from Oxford Parkway to Oxford due to become operational on 12 December 2016. All signalling on the route (including the new platforms at Oxford) is controlled by Marylebone Signalling Centre. Network Rail provided the capital for the upgrade and will recover this through a facility charge over the next 30 years, initially payable by Chiltern until its franchise expires, and then by the next franchisee. The infrastructure upgrade was carried out by main contractor BAM Nuttall, in partnership with Jarvis and WS Atkins. Oxfordshire County Council supports the scheme, but had to be convinced of the benefits of the new Oxford Parkway station at Water Eaton, which is in the Green Belt. There was a further setback to the plan when in November 2011 a planning inspector withheld approval because it was found that bats were roosting in Wolvercote Tunnel. Great Crested Newts also have a breeding habitat close to the route. The "bat problem" however seems to have been resolved. Chiltern Railways inherited a fleet of 34 Class 165 Turbos from British Rail. In December 2004 a further five Class 165s were transferred from First Great Western Link. All 39 were overhauled by Bombardier, Ilford in 2003 – 2005 including the installation of air-conditioning and removal of the hopper opening windows. As they were designed for suburban rather than InterCity use, they tend to be concentrated on services to Aylesbury and Banbury, although this stock can be found operating the service between Birmingham and Leamington Spa. Chiltern ordered several batches of Class 168 Clubmans, entering service between 1998 and 2004, and now has nine three-carriage and ten four-carriage sets. These operate across the network. In April 2003 Chiltern restored a Class 121 Bubble Car for use on the Aylesbury to Princes Risborough shuttles, a second following in May 2011 after overhaul at Tyseley TMD. In March 2013, a third Class 121 (121032) was acquired from Arriva Trains Wales for use as a spare parts donor. In January 2008 Chiltern ordered four two-coach Class 172 Turbostars. These entered service in June 2011. Because they cannot be fitted with tripcock safety equipment necessary to operate on London Underground lines, they cannot operate via Amersham unless attached to a Class 165 or 168. Although initially intended for use on all-stations services out of London, they frequently operate to Birmingham. From December 2010 Chiltern began operating two peak-hour loco-hauled services consisting of a Class 67 hauling Mark 3 coaches and a Driving Van Trailer. One set was hired from fellow DB Regio subsidiary Wrexham & Shropshire to operate a Birmingham Moor Street to London Marylebone service while the other was made up of some DB-Regio-owned Mark 3s painted in British Rail blue/grey and Virgin Trains livery and operated from Banbury to London Marylebone. After Wrexham & Shropshire ceased operations in January 2011, Chiltern began using a second ex-Wrexham & Shropshire set from May 2011. For the introduction of Chiltern's new timetable in September 2011 they had a Mainline logo and blue stripes added to their silver livery. Motive power was provided by Class 67s, 67010, 67012-015 and 67018, all modified to operate with Driving Van Trailers. In 2012 the ex-Wrexham & Shropshire Mark 3s were overhauled fitted with sliding plug doors (similar to those fitted to South West Trains' Class 444 Desiros) and toilet retention tanks by Wabtec. Once this programme is complete, a further ten Mark 3s will be overhauled by Wabtec to create a fifth set and bring the existing sets up to six coaches. In 2012 the DB-Regio-owned Mark 3s used on the peak-hour Banbury service were given a light overhaul at LNWR, Bristol, and the Virgin-liveried examples repainted into British Rail blue/grey. To allow Class 168s to be cascaded to the new Oxford services as part of Evergreen 3, more Mark 3s are to be returned to service in the future. The Class 170 Turbostars currently with First TransPennine Express were to be transferred to Chiltern Railways. MP Stephen Hammond revealed on 12 March 2014 that all the class 170/3s will remain with First TransPennine Express until the May 2015 timetable change. In January 2015 it was confirmed Chiltern will take 5 of the First TransPennine Class 170s from May 2015 and the other four from February 2016. Upon delivery, the Class 170s will be modified to allow them to be used with Chiltern's existing Class 168s, and will be reclassified as Class 168/3s. First TransPennine will sublease Class 156s from Northern Rail (which were originally intended to be used for extra capacity on Northern Rail services) to cover for the shortfall until February 2016. In early 2014, Chiltern Railways agreed a sub-lease from DRS for six Class 68 locomotives for use on its London Marylebone to Birmingham service. The new locomotives are planned to eventually replace the existing fleet of Class 67s. Maintenance and commissioning for the new fleet will be assisted by DRS. Tesco proposed building a supermarket over the railway line near Gerrards Cross railway station in 1996, which, following an initial objection by the local council was approved by the Deputy Prime Minister John Prescott in July 1998. Due to a lack of space in the area, Tesco had proposed building over the railway line, which would free up a large area of land suitable for the development. During construction, the partially built tunnel collapsed on 30 June 2005. Nobody was injured but the line was closed for over six weeks, eventually reopening on 20 August 2005. Compensation by Tesco to Chiltern Railways and Network Rail was estimated to be between £200m and the retailer pledged to fund a media campaign to win back passengers lost by the closure of its route. Construction of the tunnel finally resumed in January 2009. The store opened in late November 2010. In June 2008 it was revealed that Network Rail was examining the possibility of building high-speed lines shadowing five main-line routes, one of them being the Chiltern Main Line. Lengthening of platforms at South Ruislip, West Ruislip, Saunderton, Kings Sutton, Sudbury Hill Harrow, Sudbury and Harrow Road and Northolt Park to accommodate eight vehicles, thereby obviating the need for vehicles to be locked out of use on departure from London Marylebone. The restoration of the quadruple track between South Ruislip (Northolt Junction) and West Ruislip, allowing trains to call at both stations without blocking the line. Triple track currently exists at West Ruislip, with the up platform loop still in situ, and at South Ruislip, with the Down Main through line also in situ. This would involve the reconstruction of the new down platform at West Ruislip, and the reconstruction of the up platform at South Ruislip. Restoration of fast through lines at Beaconsfield as part of a longer-term aspiration for a 90-minute journey time between London and Birmingham. Double-track the line from Princes Risborough to Aylesbury. Remodelling Banbury Station and tracks. Building of the West Hampstead interchange to allow easy interchange with the London Overground - North London Line, Jubilee line, Metropolitan line and Thameslink services. New Chiltern Metro Service that would operate 4+tph for Wembley Stadium, Sudbury & Harrow Road, Sudbury Hill Harrow, Northolt Park, South Ruislip and West Ruislip. This would require a reversing facility at West Ruislip, passing loops at Sudbury Hill Harrow, and a passing loop at Wembley Stadium (part of the old down fast line is in use as a central reversing siding, for stock movements and additionally for 8-car football shuttles to convey passengers to the stadium for events). This 'Chiltern Metro' service was not programmed into the last round of franchising agreements. Re-opening the line between Oxford and Princes Risborough, which would provide an alternative to the Oxford-Paddington route. The Oxford to Banbury spur would then be handed over to the Chiltern Main Line to create a diversionary loop from Princes Risborough to Banbury via Oxford. This option would require an expensive crossing of the M40 motorway. Re-opening the passenger line between Aylesbury via Milton Keynes to Bedford and the line from Oxford to Bedford as part of the East West Rail Link. Two miles of the line north of Aylesbury re-opened on 14 December 2008 terminating at a new station, Aylesbury Vale Parkway. Opening a rail line from Aylesbury to an M6-M1 Parkway Station near Rugby. If this ever happened it would constitute a major re-opening of much of the Great Central Main Line, closed in the 1960s. Re-opening the former Great Western Railway branch line to Uxbridge High Street, continuing the route to Heathrow Airport. This would give Birmingham a direct rail link with Britain's largest airport. Extending Oyster Pay-as-you-go to High Wycombe and Aylesbury. The Croxley Rail Link received approval on 31 July 2013. As successful completion of Project Evergreen 3 will fulfill Chiltern Railways' obligation to invest in infrastructure there is no clear road to completion for these projects. In July 2012 the government confirmed the East West Rail Link project will see the Varsity Line reopened between Oxford, Aylesbury Vale Parkway and Bletchley in December 2017, however on 31 March 2014, Network Rail announced that the project had been delayed until 2019. This is likely to see Chiltern operate services continuing north of Aylesbury and east of Bicester to either Bedford or Milton Keynes. ↑ "M40 to put new stock on Chiltern". The Independent (London). 26 June 1996. ↑ "Fat cat row in Chiltern bid". Accountancy Age. 1 March 1999. ↑ "Full steam ahead". Accountancy Age. 14 April 1999. ↑ Six Companies Shortlisted for First Franchise Replacement Round. Shadow Strategic Rail Authority. 14 March 2000. ↑ Go-Ahead shortlisted for Chiltern and South Central rail franchises. Go-Ahead. 14 March 2000. ↑ Laing Rail to Build upon Chiltern Success. John Laing. 10 August 2000. ↑ "Chiltern Railways to Ride Again". Coventry & Warwickshire News. 10 August 2000. ↑ "Chiltern wins first 20-year franchise". The Guardian (London). 19 February 2002. ↑ "Review (proof 2)" (PDF). Retrieved 2012-11-23. ↑ "Laing accepts £887m takeover bid". BBC News. 19 September 2006. ↑ "Bidders announced for rail franchises". New Civil Engineer. 19 September 2006. ↑ Department for Transport Announces Winner of West Coast Franchise. Department for Transport. 21 June 2007. ↑ "Chiltern Railways is on the market". Railnews. Stevenage. 31 July 2007. Archived from the original on 8 November 2007. Retrieved 10 September 2007. ↑ Milmo, Dan (7 September 2007). "Arriva poised to bid for Chiltern". The Guardian. London. Retrieved 8 September 2007. ↑ "Go-Ahead interested in Chiltern Railways bid – CEO". Reuters. 7 September 2007. Retrieved 8 September 2007. ↑ O'Connell, Dominic (9 December 2007). "Rail rivals line up Chiltern". The Sunday Times. London. (subscription required (help)). ↑ "Deutsche Bahn and NedRail line up Chiltern". business-sale.com. 11 December 2007. ↑ "Deutsche Bahn announces acquisition of Laing Rail" (Press release). Chiltern Railways. 21 January 2008. Retrieved 22 January 2008. ↑ "Review of the year to 31 December 2010: Strongly positioned for future growth" (Press release). Arriva. 3 May 2011. 1 2 "Oxford to Bicester Town Service Change of Train Operator". First Great Western. Retrieved 28 April 2011. ↑ Yonge, John (November 2008) . Jacobs, Gerald, ed. Railway Track Diagrams 5: Southern & TfL (3rd ed.). Bradford on Avon: Trackmaps. maps 41C, 42A, 42B, 43A. ISBN 978-0-9549866-4-3. 1 2 "Chiltern Oxford Launch". Chiltern Railways News. Chiltern Railways. Retrieved 20 January 2016. ↑ "Proportion of trains running on time". ↑ "Chiltern Railways admits problems". 16 November 2015. ↑ "Rail performance results period 9". Network Rail. ↑ Dunhill, Lawrence (24 September 2011). "Beaconsfield commuters say new Chiltern line is 'misery'". Bucks Free Press. High Wycombe. Retrieved 5 October 2011. ↑ Cain, Rebecca (4 January 2011). "Commuters call for a return to a better train service". Bucks Free Press. Princes Risborough. Retrieved 27 January 2013. 1 2 3 "£250 investment from Chiltern Railways creates new main line" (PDF) (Press release). Chiltern Railways. 15 January 2010. ↑ "£250m Rail Investment to Bring Much Faster Journeys for Chiltern Passengers" (Press release). Network Rail. 15 January 2010. 1 2 "Evergreen 3 progress". Modern Railways. London. December 2010. p. 9. ↑ "Chiltern Railways plan to make Bicester well connected". Railnews. Stevenage. 29 August 2008. Retrieved 7 September 2008. ↑ "Project Evergreen 3". Chiltern Railways. 2009. Retrieved 6 February 2009. ↑ "Chiltern Railways given green light to build new rail line between Oxford and London" (Press release). Chiltern Railways. 18 October 2012. Retrieved 18 November 2012. ↑ McGregor, Sam (19 October 2012). "New £130m rail link to London approved". Oxford Mail. ↑ "Chiltern Railways announces £250m improvements and new main line to be built by BAM Nuttall". New Civil Engineer (London). 15 January 2010. ↑ "BAM Nuttall lands £190 million Evergreen 3 Contract for Chiltern Railways" (Press release). Camberley: BAM Nuttall. January 2010. ↑ "Rail link plan runs into problems". Oxford Mail. 15 September 2009. Retrieved 10 October 2009. ↑ Little, Reg (17 November 2011). "Rail line hits buffers amid bat risk fear". The Oxford Times. p. 1. ↑ "Chiltern Railways: Oxford–London line statement". 8 March 2012. Retrieved 18 April 2012. ↑ Our Train Fleet. Chiltern Railways. ↑ "BR green 'bubble car' headlines £1million upgrade by Chiltern". Rail Express. 27 May 2011. ↑ "Chiltern commence Birmingham loco-hauled" Archived 16 October 2013 at the Wayback Machine.. Rail Express. 14 December 2010. ↑ "Chiltern mounts Silver Trains Challenge to Virgin". Railnews. 5 September 2011. ↑ "Chiltern Railways puts refurbished Mk 111 coaches into service". Railway Gazette. 31 May 2012. ↑ Comfort, Nick; Pritchard, Robert (2010). "Marylebone-Birmingham expresses from December". Today's Railways. Sheffield (99): 7. ↑ "Campaigners' fury as nine TransPennine Express trains sent south in 'crazy and scandalous' move". Manchester Evening News. 3 March 2014. ↑ Wilson, James (9 January 2015). "Train users in Mid Cheshire suffer capacity setback". The Knutsford Guardian. Retrieved 28 February 2015. ↑ "Chiltern leases six Class 68 locos for Mainline services in £15m deal". Cognitive Publishing Ltd. Retrieved 12 August 2014. ↑ "Angel Trains orders 'green trains' for the UK rail market" (Press release). rail technology magazine. 15 April 2014. ↑ "Passenger Board Annual Report 08/09" (PDF). Chiltern Railways. 24 June 2009. ↑ "Coaching Stock Design Contract for Chiltern Railways". Railway Technology. 21 July 2009. 1 2 Glancey, Jonathan (25 August 2005). "In a hole". The Guardian. Retrieved 17 June 2009. ↑ Hansford, Mark (15 January 2009). "Tesco restarts work at tunnel collapse site". New Civil Engineer. London. Retrieved 6 May 2009. ↑ Abell, Jack (3 December 2010). "Tesco finally opens its doors". Buckinghamshire Advertiser. Uxbridge. Retrieved 13 December 2010. ↑ "Major new rail lines considered". BBC News Online. 21 June 2008. Retrieved 1 April 2010. ↑ "Route plans 2008: Route 16: Chilterns" (PDF). Network Rail. April 2008. p. 12. ↑ "Route plans 2007: Route 17: West Midlands" (PDF). Network Rail. 2007. p. 35. ↑ "There's more to Chiltern than the Chilterns – The Case for a Chiltern Metro". London Travel Watch. January 2001. Archived from the original on 11 March 2007. 1 2 Buggins, Arryn (10 August 2000). "Bid To Reopen Central Railway To Passengers". CWN. Coventry. Retrieved 15 April 2008. ↑ "Route plans 2007: Route 16: Chilterns" (PDF). Network Rail. 2007. p. 17. ↑ "Services at Aylesbury's new train station to begin on Sunday". The Bucks Herald. Aylesbury. 9 December 2008. ↑ Buggins, Arryn (11 August 2000). "The Next Train Calling at Rugby... Could be Chiltern". CWN. Coventry. Retrieved 15 April 2008. ↑ "Exciting times ahead for passengers using Chiltern Railways!" (Press release). Chiltern Railways. 22 January 2007. ↑ "The Croxley Rail Link Order 2013" (PDF). The Stationery Office. Statutory Instruments 2013 No. 1967. Retrieved 21 October 2013. ↑ "Private Sector Specification and Delivery of Enhancement" (PDF). International Council on Systems Engineering. 22 June 2010. ↑ "Disappointment as East West Rail delayed by two years" (Press release). Bucks Herald. 31 March 2014. Retrieved 31 March 2014. Holley, Mel (11–24 February 1998). "The quiet revolution". RAIL. No. 324. EMAP Apex Publications. pp. 26–29. ISSN 0953-4563. OCLC 49953699. Wikimedia Commons has media related to Chiltern Railways.